Supervisor Don Knabe, who is also the Chairman of the Metro Board of Driectors, talks about the future of Metro Rail on Friday morning. 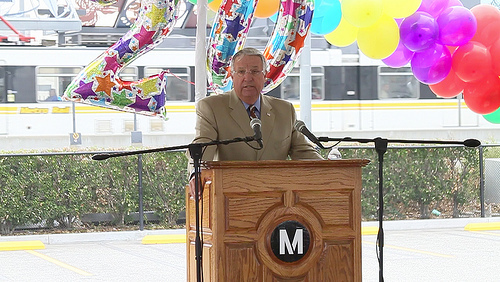 Metro officials gathered Friday morning near a Blue Line station in downtown Los Angeles to commemorate the recent 20th anniversary of Metro Rail. The Blue Line began service on July 14, 1990 — in the 27 years previous, there was only bus service available in Los Angeles County. It was a low-key affair, with the speakers saying they believed the county made the right decision to launch a rail program to help people get around. County Supervisor Zev Yaroslavsky, who is also a member of the Metro Board of Directors, made two key points. First, Yaroslavsky pointed out that the 30/10 Initiative build a dozen Measure R transit projects in the next 10 years instead of the next 30 would represent the single biggest investment a region in the U.S. has made in upgrading its transit infrastructure. Second, he said the building of rail and the Orange Line busway were helping those who use and who are dependent on transit get around in a speedier fashion — saving them, in some cases, hours each week. “This is also about the quality of life of every individual man, woman and child in the county,” Yaroslavsky said. The full press release from Metro is after the jump. Metro Rail’s 20th anniversary was marked today at an event that paid homage to Los Angeles County’s public transit history while celebrating a massive rail expansion program poised to, literally, transform the urban landscape while generating well over 100,000 new jobs. Metro officials noted that construction of the Metro Rail lines, so far, has created more than 300,000 direct and in-direct jobs and helped ease traffic and air pollution by coaxing solo drivers from their cars and trucks. Knabe noted that construction of Phase I of the Expo light rail line from downtown Los Angeles to Culver City is well underway and Phase II to Santa Monica should break ground early 2011. A groundbreaking was held last month for the 11-mile extension of the Metro Gold Line Foothill Extension from Pasadena to Azusa. Planning and environment work is being completed for other rail projects including a light rail connection with LAX, a subway extension to Westwood, light rail lines in the Crenshaw and South Bay corridors, rail extensions to the eastern portions of Los Angeles County, a downtown regional connector that will connect the Metro Gold, Blue and Expo lines, a rapid transit project in the I-405 corridor linking the Westside and San Fernando Valley and more. Plans for high speed rail also are in the works. Details: Metro.net/measurer. The supervisor also noted that Metro Rail has spurred improvements in the Metro Bus system, and the two modes complement each other. The Metro Orange Line busway in the San Fernando Valley, now being extended to Chatsworth, and more than two dozen Metro Rapid lines serve Metro Rail stations. Metro officials noted this huge investment in transportation infrastructure is giving developers a powerful incentive to concentrate new housing and commercial development around Metro Rail and Metro Orange Line stations. Major housing and commercial development around Metro Rail stations has helped revitalize Long Beach, Hollywood, the San Fernando Valley, downtown Los Angeles, Pasadena and other areas of Los Angeles County. Last spring, the W Hotel opened above the Metro Rail Hollywood/Vine station and the Kodak Theater, home of the Oscars, is located atop the Metro Rail Hollywood/Highland station. NBC is poised to relocate their headquarters above the Universal City Metro Rail station, and a massive $1.2 billion mixed use project is planned around the subway and Metro Orange Line terminus in North Hollywood. In November 2008 more than two thirds of voters approved Measure R, a half cent sales tax in Los Angeles County, that will pay for a dozen transportation projects over 30 years. However, Metro is urging the Obama Administration and Congress to approve a 30/10 plan and let Metro leverage local Measure R monies with advance federal low interest loans or loan guarantees and bonding to complete a dozen Measure R projects within a decade. Mayor Antonio Villaraigosa, who first proposed the 30/10 initiative, noted this acceleration would boost the region’s construction industry by generating 160,000 new jobs while eliminating $3.4 billion in project construction costs over the long term. Together the 12 projects will reduce vehicle pollution emissions by 568,000 pounds annually, save 10.3 million gallons of gasoline per year and reduce traffic congestion by eliminating 208 million vehicle miles from roadways. U.S. Transportation Secretary Ray LaHood has pledged support for 30/10 and Senator Barbara Boxer and other legislators are mobilizing Congressional support for 30/10, which also is supported by the U.S. Conference of Mayors. On a parallel track, Metro also is developing a strategy to expedite the construction of Measure R highway projects, focusing on public-private partnerships. For information about Metro Bus and Metro Rail service, check out the trip planner at metro.net or call 1-800 COMMUTE. Call 511 or Go511.com for public transit, carpool, vanpool information and real time traffic updates in Southern California 24/7.